The National Football League has announced the suspensions of the players that were implicated in the Bountygate scandal that enveloped the New Orleans Saints organization and in particular former defensive coordinator Gregg Williams (Related: my take on the coaching suspensions). They are pretty strong and here they are. 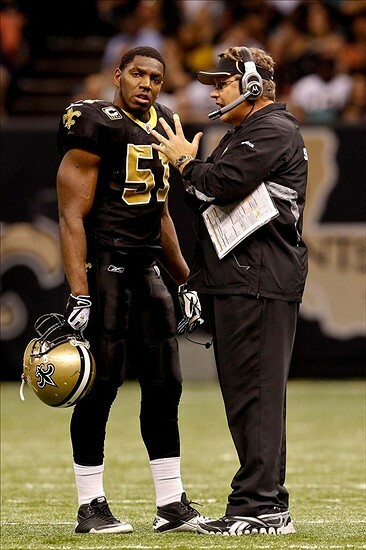 By far the strongest suspension (and one of the strongest suspensions in NFL history) is on linebacker Jonathan Vilma, who reportedly put $10,000 cash to anyone who would knock Vikings quarterback Brett Favre out of the 2010 NFC Championship Game, who has been suspended for all of 2012, including if the team makes Super Bowl XLVII. The second strongest suspension was given to Packers defensive end Anthony Hargrove, who also was said to have targeted Favre in that game and also had obstructed the league's investigation by being untruthful to investigators, as he has been suspended for eight games. The league says that Hargrove eventually admitted his role in attempting to go after Favre. Saints defensive end Will Smith was given a four game suspension as the league says he worked with Williams and helped set up the bounty program and Browns linebacker Scott Fujita was suspended for three games for his role in Bountygate. There is no question that these suspensions are pretty stiff but I also feel that they are fair as I think the league has sent a very strong message that these type of actions are not welcome nor will never be welcome in the NFL.